So began my afternoon tour of Jaipur in September 2004. Scrambling out of the old white Ambasador car, I snapped a quick picture of the famed façade, disappointed to learn that the rest of the palace had crumbled over the years. The tour continued on, taking us to the Jaipur Observatory (Jantar Mantar), built in 1728 by Maharaja Sawai Jai Singh, the founder of Jaipur. I snapped away at the imposing structures built to read the universe as accurately possible, only half-listening to the tour guide, thus annoying him further. The rulers had built these forts to endure, which clearly their architects and artisans had accomplished, with the walls intact and still so vivid after being caressed for hundreds of years by the dust and dry winds of Rajasthan. Kneeling where the queen would have sat, I poked my camera through the window opening to snap a picture of what would have been her limited view of the outside landscape while she was throwing those petals. Our tour ended at the City museum in Jaipur, under the patronage of the current Maharaja of Jaipur. Listening to tales of the Fat Maharaja, my cousin and I lingered in front of the diorama showing a queen sitting among her servant girls as they dressed her in jewels and embroidered clothing. As I tried to sneak my camera out from my bag, the tour guide smirked and shook his head at me. Amanjeet is a writer and photographer living in Toronto. Her photography can be seen at www.galleryakc.com. She has a wonderful photo essay on the exhibition at KuchBatao.com. When I was a child, I was obsessed with the 1,001 Tales of the Arabian Nights. I read every book in the library and painted huge colourful murals on my walls of genies coming out of bottles, turreted palaces and fairy tale forts. Many years later, as an adult, I went to India to recover from loss and depression, stemming largely from the sudden and unexpected death of my mother. Imagine my surprise when I went to the Maharaja’s Palace in Mysore, and to the land of Maharajas; Rajasthan, and saw my bedroom walls come to life! I cried many times touring these fantastic palaces as I remembered my mother and how she had brought me up to believe in magic. India turned out to be the land of my imagination, heart and soul. Traveling in India healed me, and gave me back my enthusiasm for life. And, I am especially enthusiastic about Rajasthan. In Rajasthan, there seems to be no end to the wonders. The golden city of Jaisalmer with its fairy tale fort; the riches of Udaipur and the shimmering lake surrounded by palace hotels; the massive Amber Fort overlooking the pink city of Jaipur. But one of my favourites is the Mehrangarh Fort in the centre of Jodhpur. I was advised to rent the audio tour and I am so glad I did. The present-day Maharaja’s voice regales you with spell-binding tales as you walk through the huge fort-palace, past magnificently furnished rooms, a somber enclosed courtyard in the women’s quarters and ramparts that soar hundreds of feet above the Blue City. The most moving stop on the tour was the site of rows of small handprints at the massive exit gates. These are the handprints of the wives of Maharaja Man Singh, who committed sati by throwing themselves on his funeral pyre in 1843. They made these marks on their way out of the fort to a certain death. So, Rajasthan is not just about glorious art and architecture. It is also about stories – stories that come alive when you visit the Land of Kings. Mariellen Ward is a freelance travel writer who is passionate about sharing the beauty of India’s culture and wisdom. She has traveled for about a year altogether in India and publishes an India travel blog, Breathedreamgo.com. To kick off our call for your maharajas stories, we are delighted to share with you this story from Barbara Stephen. Just last week Barbara wrote to us with her very own memory, not of a particular Maharaja, but how a family friend brought a little bit of royalty into her family’s life through a silver cup and saucer. Dr. George Martos was once the personal physician to Maharaja Yeshwant Rao Holkar II of Indore and he gave her mother this gift after a trip to India to hunt tigers with the Maharaja. During the 1950s and early 1960s, my mother worked with Dr. George Martos, a Hungarian doctor who had gone from teaching at the University of Berlin to Indore where he was Medical Officer of Health during WWII, and was closely connected with the Maharaja. He built a hospital for him there, and retained his connection with Indore after immigrating to Canada after the war, requalifying, and opening an obstetrical practice in Toronto. From time to time the Maharaja would extend an invitation to join him in India for the tiger hunt, and in due course a ticket would arrive from the maharaja desk at a London travel agency. My mother heard lots of details about life in Indore, and as Dr. Martos was also my doctor and a family friend until his untimely death, I too learned about raising lion cubs, managing elephants, hunting tigers, etc. I suspect the current Maharani may remember Dr. Martos from her childhood. I believe it was my mother, Charlotte Burry, who wrote to inform the family of his death in the 1960s, not too long after the death of the Maharaja. Dr. Martos always spoke of the Maharaja with great affection and respect. 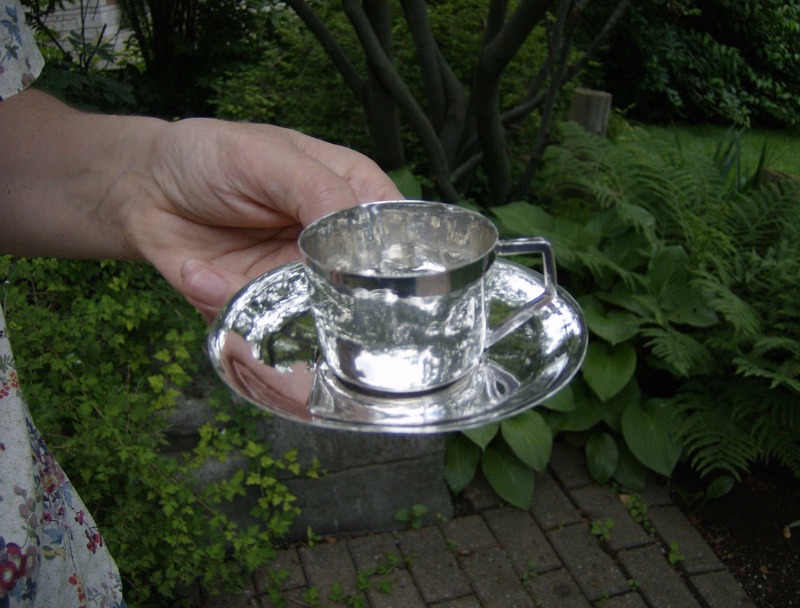 My mother was given a silver demi-tasse cup and saucer from Indore after one of his last trips, very plain and moderne in style, with an angular handle. It was locally made and he indicated to her that it was quite special. — Barbara Stephen is a Curator Emerita and Early Chinese Specialist with the Royal Ontario Museum. I will post more about the Maharaja of Indore (now part of the state of Madhya Pradesh) later. Not only was he a fascinating individual – he was photographed by Man Ray, commissioned a sculpture by Brancusi, built hospitals and loved cars – we expect to have his life-sized portrait in the exhibit! Do you have a Maharaja story? We’re on the prowl for your connections and we’ll be highlighting various anecdotes and memories that come our way. Share your story here.